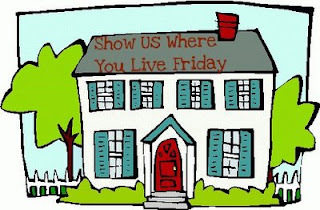 It is Friday which means it is time for "Show Us Where You Live" over at KellysKorner! I was not sure I was going to be able to participate this week due to the ton of stuff I am having to do to get ready for the move but then I remembered I had already taken pics and downloaded them! Yeah! This is the Before picture of my sewing room/office/4th bedroom from abt a month ago. Kinda scary I must admit! I was in the midst of reorganizing so it would be not so embarrassing for potential buyers to see. Another Before picture but see there in the background some resemblance of order over on the bookcase! I was making progress even at 1 am! After a full day this is what the result was. A wonderful neat and organized sewing room/office/4th bedroom that I just love to pieces! This is my favorite redo. I use to have all of my fabric stacked on top of each other in the closet on my buffet. It was so hard to get to in there but now a piece of cake! I forgot to take a pic of the closet now so I will have to do that and post it later. Thanx for stopping over! Have a wonderful weekend! WOW! You did that in one day! Great Job organizing! I wish I has the talent to sew! Thanks for sharing. Wow, what a before and after in one day! I am impressed!! Great job! look at all your wonderful fabrics!! Oh, what I would give to go through your fabrics!! :) Sadly, both boys are pretty much done with bibs so I don't foresee buying many more. :( In fact, I gathered them all up and put them in a basket until I find someone to make them into quilts for them. Do you know anyone who can do that??? How is the packing coming along? We leave Virginia in 17 days!!!! Looks great. I will check back again soon. Loved reading. I will take look... the house was painted when we bought it and I loved the colors. I'm enjoying looking at your blog. Thanks for your visit and I can't wait to see more of yours!